NEET PG Examinations are now online examination conducted as a single Test Containing various types Questions from all subjects; Anatomy, Physio, Biochem, Medicine, Pharma, Radiology, with newly added sections on Image-Based Questions. As per latest feedback the questions test memory, concept, case solving ability, important, Medical concepts, pathology concepts, genetic concepts and a diverse group of questions. We at Medexamsprep have realized the importance of NEET preparation in relation to changing and latest trends. High yield, Latest Examination type questions, Questions on important topics, questions based on the most frequent topics are asked. We provide precise explanations of Questions as well. 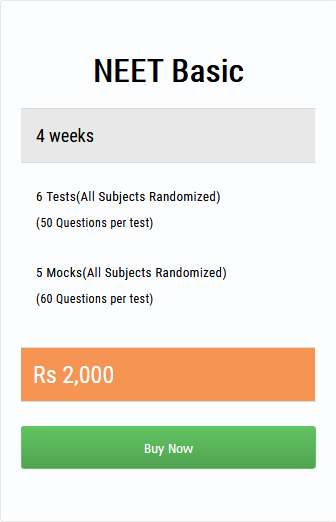 The Portal is based on standard, randomized Online questions systematically subject wise which gives students a chance to revise in the best manner. Best books are consulted like Grays, Lasts Anatomy, BD Chaurasia for Anatomy, Ganong, Best and Taylor, Guyton for Physiology, Stryer, Lehninger and Harper for Biochemistry Anderson and Robbins for Pathology, Harrison, Kalra, and Davidson for Medicine Sabiston and Schwartz for Surgery. Appropriate selection of questions based on the percentage of questions asked from the Subjects like Anatomy, Physiology, Biochemistry, Pharmacology, SPM (Main), Pathology (Main), Microbiology, Surgery, Gynae/Obs, Radiology is taken into account. Take all Standard Books as Reference only. Use Online Resource like Medexams for the thorough revision. Browse other good resources for NEET Mch here. Best Tips for studying Medicine for NEET PG 2018.